I was born from a Romani Gypsy heritage, a family that settled down in the south of England in the heart of beautiful Hampshire. My Great-Grandfather was the first of our line to settle in a house and built himself a home and business next to a running stream on the edge of common land. I have few memories of this mysterious man in my life as I was young when he passed on to his next great adventure. My Nanny and I would pop over to the house to bring him lunch and I was always excited to have my palm crossed with whatever silver he had for me that day. Despite building himself a beautiful home, he was uncomfortable with the space and lived in just one room of the house, his bed, cookstove, rocking chair, table and open fire all in one room at the back of the house. The room always smelt of tobacco and woodsmoke. When he spoke to me, I understood only a few words of his heavily accented speech. Of course, I did not know that he spoke a pidgin language of English and Romani to me, I just nodded and smiled, fiddled with whatever wood he had been whittling and wrinkled my nose each time he spat in the fire. 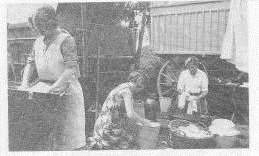 My father was the last one in my immediate family to be born in a caravan, and by my birth we little resembled the family of gypsies living in Vardos camped on common land that you see in the pictures here (my great aunt). Even so, my relatives seemed wonderful and magical to me. They had a way with the land that was not lost when homes were built of brick instead of wood and wheels. I was raised hedgerow picking and mushroom picking, chasing chickens and watching my Nanny heal almost any sick animal that was brought to her door. The kitchen was home to cats and dogs, hedgehogs and chickens that followed my Nanny everywhere. There was always something to learn from the stories my loving Grandad told me as we walked. As a child, I longed to be like him, from his easy smile and mischievous nature to his olive skin, green eyes and black hair. My Grandad holds a special place in my heart. This history is something that lives in my blood, and my name honours that heritage. My family line were proud, honest and hardworking people, and my daily life seeks to honour that. But they were also fiercely independent people, each and every one living true to their own nature, and I too seek to carve my own way through life – magical and mundane – in a way that respects my own true nature. I have turned my hand to many trades and paths of study in my life, but I am probably most well known for my previous holistic centre, pagan store and coffee shop in the south of England. Thanks to the loyalty and love of my wonderful clients, my business won a ‘Best Small Business’ award in 2007. My store closed prior to my move to Canada, but even now, years later, I still receive heart warming emails from clients and customers who let me know how the store and our therapists touched their lives. Since moving to Canada I have been blessed with two children who have kept me very busy, and I have focused on writing and painting whenever time and inspiration allows.